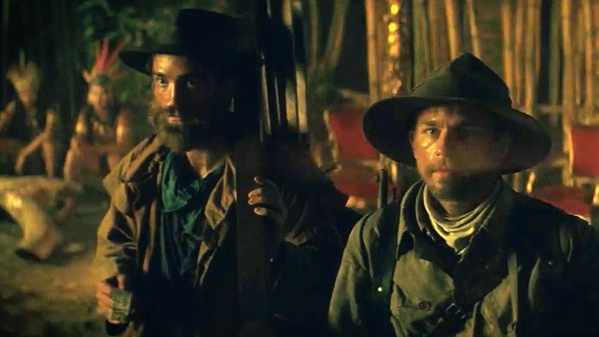 A new UK trailer for James Gray's latest film, an adaptation of David Grann's book, titled The Lost City of Z, has debuted. The film tells a thrilling adventure story of explorers who travel into the Amazon to find a mysterious lost civilization. Starring Charlie Hunnam as legendary British explorer Col. Percy Fawcett, along with Tom Holland as Jack Fawcett and Sienna Miller as Nina Fawcett. The cast includes Robert Pattinson, Angus Macfadyen, Daniel Huttlestone, Edward Ashley and Johann Myers. This trailer is timed with the announcement that The Lost City of Z will also be playing at the Berlin Film Festival in February, after first premiering at the New York Film Festival last fall. The cinematography in this looks gorgeous, and the film had some great buzz coming out of NYFF. I'm really looking forward to seeing this. Hunnam's accent is so weird. I still can't get over it. It sounds like a bad British accent from an American (even though he is British!!!). Hahah, I keep thinking the exact same thing. All the way back when he was on Undeclared, I thought it was fake. Then I saw where he was from.... nope! Not fake! Wasn't the 'gold' actually something else, like a great knowledge, that westerners couldn't get their greedy brains around? Hey Charlie Hunnam!! The guy who ruined Pacific Rim!! The guy who wrote Pacific Rim ruined it for sure. Hunnam was just the topping. Robert Pattinson looks like someone threw some old clothes on him and a fake beard!! ahahaha!! Isn't this the project intended for Brad Pitt?